Bronchitis refers to a condition when the lining of the bronchial tubes gets inflamed or swells up. The bronchial tubes carry the airflow from the trachea to the lungs. It is a respiratory disease and causes symptoms like cough, chest tightness and shortness of breath. It is often accompanied by the formation of yellow-grey mucus. Bronchitis can be of two types namely, Acute Bronchitis and Chronic Bronchitis. Out of these two types the former one is more common. It usually takes place due to cold and flu and does not require much medical attention as it is a self limiting disease and hence tends to heal on its own. On the other hand, Chronic Bronchitis can be associated with Chronic Obstructive Pulmonary Disease (COPD). 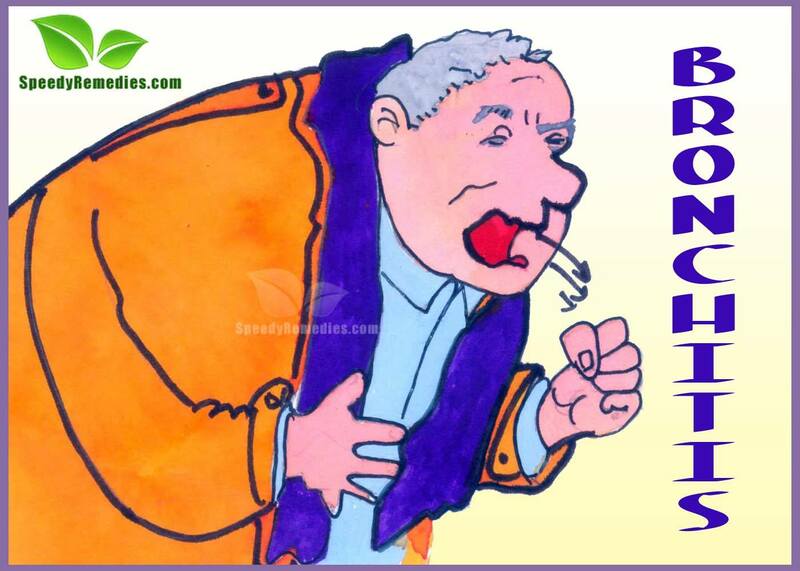 Chronic Bronchitis is a serious recurring condition and is mostly caused by smoking. It makes the sufferer more vulnerable to bacterial infections of the airway and lungs, for example Pneumonia. When this inflammation occurs in Asthma patients, it is known as Asthmatic Bronchitis. People tend to take cough suppressing medicines for immediate relief but some such medicines worsen the situation by meddling with the mucus. Same is the case with antibiotics. Therefore, it is better to stick to natural home remedies for Bronchitis to cure it as naturally as possible without any side effects. The most common cause responsible for causing Bronchitis is viral infection. Bacterial and fungal infections can also be blamed for the same but to a much lesser extent. As for Chronic Bronchitis, cigarette smoking is the primary cause of the disease. Other factors include air pollution and other lung irritants and cold air. Industrial pollution prevalent in coal mines, metal molding factories, grain and textile mills increases the risk of the people working in such places to develop this disease. A weak immune system can also be attributed to such respiratory diseases. Repeated attacks of Acute Bronchitis pave way for Chronic Bronchitis. Acute Bronchitis is generally accompanied by an upper respiratory tract infection. It usually starts with symptoms like running nose, sore throat and sinus infection. Other symptoms include cough, general illness, fatigue, headaches, body aches, presence of a wheezing sound when breathing, shortness of breath, chest congestion, mild fever and chills. As Bronchitis is an caused by infections, the most obvious remedy in this regard would be to stay away from infections by not sharing food, cups, glasses, or eating utensils with an already infected person, washing hands frequently and giving up smoking. • Drinking fresh cabbage juice on a daily basis is a valuable natural remedy for healing the disease. • The most common home remedy for Bronchitis related throat inflammation is to gargle with salt water. • Cover an onion slice with honey and leave it in this condition overnight and then remove the onion slice. Taking one teaspoon of this therapeutic honey four times in a day helps cure the disease. • Taking half a glass of milk mixed with half a teaspoon of turmeric powder on an empty stomach is one of the easiest possible natural home remedies for Bronchitis. It should be taken 2-3 times on a daily basis. • Take 250 ml of water, 50 grams of fresh spinach leaves, one teaspoonful of honey and a pinch of ammonium chloride. Mix the ingredients to prepare an infusion to get rid of the mucus. • Prepare a hot poultice of linseed by mixing one cup (16 tablespoons of the linseeds) with one cup of warm water. Applying this linseed poultice on the front and back of the chest is one of the most popular home remedies for Bronchitis. • Prepare a tea by mixing half a teaspoon of ginger powder, half a teaspoon of pepper and a similar quantity of cloves. Simply licking this mixture is equally beneficial in treating this disease. • Another such remedial tea can be prepared by adding half a teaspoon of licorice root in one cup of boiling water and straining after ten minutes. Having this tea 3-4 times a day for at least one week serves as a good home remedy in the treatment of Bronchitis. Savory or thyme can also be used in place of licorice root. • Take one teaspoon of linseed, one teaspoon of sesame seeds, one teaspoon of honey and a pinch of salt. Mix the ingredients. Taking this mixture before going to bed is one of the highly recommended natural home remedies for Bronchitis, especially the chronic form of the disease. • Prepare a mixture of one tablespoon of poppy seeds, one tablespoon of honey and 8 to 10 tablespoons of coconut milk. Taking this mixture daily at night is beneficial in curing the disease. • Mixing half a teaspoon of powdered dry root of Chicory with one teaspoon of honey and taking this mixture thrice a day provides relief by reducing the mucus. • Take a cup of orange juice and mix powdered almonds (a powder of seven kernels of almond) in it. This is an excellent natural home remdy used for the treatment of Bronchitis. • Extract the juice from Holy Basil leaves. Take half teaspoon of this juice, one teaspoon of honey and half teaspoon of ginger juice and mix these ingredients. Taking this mixture two to three times a day acts as a good natural cure for the disease. • Add one cup of grinded horseradish root to a cup of boiling water and cook for about 5 minutes. Having this mixture thrice a day is one of the most effective natural home remedies for Bronchitis treatment. Drinking plenty of water or fluids is an effective way to wash away the mucus. The diet should constitute a proper mix of fresh fruits, vegetables, grains, seeds and nuts. Generally, spicy foods are not considered good for health. But one is allowed to have such foods in order to get rid of the mucus. Lemon tea is also beneficial in the treatment of Bronchitis. Consuming vegetable juices especially, a combination of carrot juice and spinach juice is also a healthy option. Foods rich in manganese, particularly pears, nuts and beans are valuable as they facilitate the healing process. Until the disease is completely cured, it would be wise to resist the temptation of eating unhealthy mucus forming foods like white sugar and its products, white flour and its products, refined and packaged foods, and many non vegetarian foods.